The emptier wishing to return used industrial packaging labelled with a Retourservice ticket fills out the Retourservice ticket in full and signs the legally binding pick-up order. The emptier then faxes the ticket to the Fass-Braun GmbH fax number displayed on the ticket. 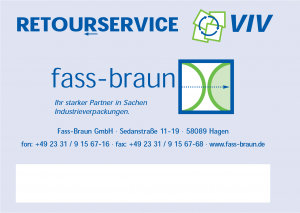 Fass-Braun GmbH or one of its partners collects the packing anywhere in Germany within 10 days of receipt of a properly completed take-back service ticket. Collection from other locations in Europe is agreed on an individual basis.